Professional cleaning equipment on stock! 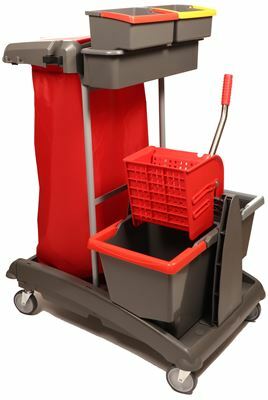 Complete household trolley with press. Polypropylene and steel trolley (HACCP compliant). The steel parts are treated with anti-oxidant and anti-scratch paint that ensures high resistance to chemicals, weather and UV rays. Thickness of the tube 1.5 mm. The amount is fixed with screw, washer and nut. Bag holder attached directly to the steel upright. The wheels are screwed into threaded brass bushings inserted into the mold.